Just a quick update from the world of Glatze. Despite keeping a low profile for a while, to allow my other selves to flourish, I have been asked to play a gig on the 20th of August in Cheltenham, which I was very happy to accept! Callie who saw me play at Supersonic last year has sorted out a night for me to play in place of the July Supersonic this year. The only problem is Cheltenham didn’t seem to have its act together for a July date, so she has lined me up an August date instead. As ever, it’ll be balls-out live fun from me…come along if you can! 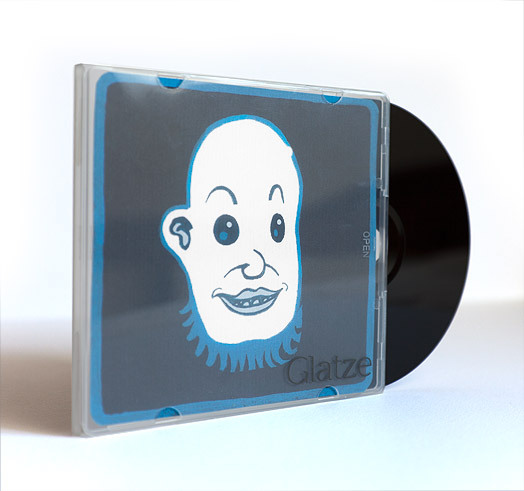 Also, I have been putting the finishing touches to my new, self-titled “Glatze” EP. Never one to do things half-heartedly I am producing some lush demo CDs (mock-up below – I’m loving my black faced CDRs) and sending this out to some people I want to sign me. Mike Patton, if you are reading this, that means you! :) I hope the world is ready for my new Romany Surf Step genre. The mighty Centrifuge certainly are, and I am happy to announce that they plan to release it soon, thanks Wassim! I have two “reviews” in already. I sent it to BJ Cole, who I’d like to work with if anyone gives me an album deal, and he said “I have had a listen to your tracks, and think they are great! You have a very original direction“. Also, the chap who mastered it said “It’s great stuff! I’ve never really heard anything like it. Sure, it’s music, and it sounds like a lot of stuff, but there is a unique voice, and it’s good!“. Thanks to Ben Waddington for the main artwork.